At the Path of the Buddha retreat, Thay focused on global ethics. A handout (see below) summarized four different approaches to ethical questions. Here is an excerpt from Thay’s last Dharma talk, in which he discussed the Buddhist approach. We study this line: “Both subject and object of perception manifest from consciousness according to the principle of interbeing.” This expresses an understanding of deep Buddhism. The question of whether we continue to be after the disintegration of this body has been asked by so many people. And there are many ways to answer, according to our capacity to understand. There are at least two kinds of Buddhism. Those who practice popular Buddhism are practicing more devotion than meditation, so their understanding of rebirth is quite different. But to answer this question satisfactorily, you have to use the understanding given by deep Buddhism, the understanding that is in accord with science. We usually believe that consciousness is something inside of us, and we go and look for the world outside. We think there is an objective world outside and there is a subjective world inside. Remember when we read from “Winnie the Pooh”? Winnie the Pooh thought he saw the footprints of a hostile animal, and he became afraid. But with the help of Christopher Robin, Winnie the Pooh discovered that the footprints he found on the snow were his own footprints! The same thing is true with the object of our inquiry – the so-called objective reality of the world. We think it is something distinct from our consciousness, but in fact it is only the object of our consciousness. It is our consciousness. That’s the hardest thing to understand and a basic obstacle for us and for science. Now a number of scientists are beginning to understand this concept. The British astronomer, Sir Eddington, said that on the unknown shore we have discovered footprints of unknown people, and we want to know who has been there before us. We come, inquire and investigate, and we find that they are our own footprints. The world outside is our consciousness, is us. It is not something separate and distinct. The object and the subject of perception inter-are. Without subject, there is no object; without object, there is no subject. They manifest at the same time. To see means to see something. The seer does not exist separately from the seen; they manifest at the same time. If you imagine that the seer is independent and goes out in order to see the seen, that is a mistaken perception. Consciousness is always consciousness of something, and consciousness only lasts a millisecond. Consciousness is like an elementary particle, like an electron; its nature is non-local. Nonlocality is a word used by scientists about time in quantum physics. An elementary particle can be everywhere at the same time. We think that one thing cannot be several places at once, but scientists have agreed that an elementary particle – an electron – can be both here and there at the same time. It can be both this and that at the same time. It can be you, it can be me. It’s like a flame on the tip of a candle. You think there is one flame, but really there is a succession of millions of flames, one after the other, that give the impression that it is only one flame. The flame of this moment gives rise to the flame of the next moment, and the flame of the next moment gives rise to the flame of the next moment. Things exist only in one millisecond. And that is true not only with consciousness; it is also true with our bodies, because cells die to give rise to other cells. In a month, all our cells will be new cells. It’s like a river. We see a river and call it one name, but the water is not the same water, it’s always changing. You cannot swim twice in the same river, and it is not the same person who goes into the river. Tomorrow it will not be “you” who goes into that river. You will have changed, just like the river constantly changes. Buddhism offers the example of someone holding a torch and drawing a circle in the dark. Since he moves the torch quickly, you have the impression that there is a circle of fire. But in fact there is only one dot of fire. Everything is fleeting and impermanent. Modern science acknowledges this. Science is now capable of demonstrating no-self. Neuroscience teaches that neurons communicate with each other very well, and they operate together without a leader or a boss. They are like an orchestra playing beautiful music without a conductor. Our bodies are made of many cells and there is coordination among the cells; they don’t need a president of all the cells in order to make decisions. There is no-self. If a scientist knows how to maintain that insight on life, then that flash of insight will become a liberating factor. If you just accept that idea as a notion, that is not enough to liberate you from your fear, your desire, your despair. No-self and impermanence as notions are not very helpful. You need to maintain a long-lasting understanding in order to get liberation. That is why samadhi has been translated, “you maintain it like that.” You keep the insight alive and you make it last. In your daily life you are able to maintain the vision of impermanence, the vision of no-self as a living experience. Only that insight can liberate you from fear, from anger, from separation. It is like when you boil potatoes, you have to maintain the fire underneath them for at least twenty minutes for the potatoes to cook. If you light the burner and then you turn it off, you will never have cooked potatoes. Samadhi is like that. Samadhi is the concentration needed to maintain the steady presence of that insight. Scientists are capable of finding no-self and impermanence, but what they need is samadhi to maintain that understanding throughout the day. They need the tools of mindfulness, concentration, and samadhi, in order to discover more. It would be helpful to have practitioners of meditation and scientists to collaborate, in order to discover more about ourselves. You can be sure that the world is an object of mind. The sun, the moon, the earth, the cosmos, the galaxies – they are all objects of mind. And our body, also, is an object of our mind. And our mind, also, is an object of our mind. That is why we can investigate the object of our mind. When we understand the object of our mind, we understand our mind, because mind and object of our mind inter-are. One cannot be without the other. When we believe that consciousness is permanent, and only the body perishes, that the soul continues and goes to heaven or hell, that is eternalism. A right view should transcend a view of eternalism. A permanent, immortal soul is something that cannot be accepted, either by good Buddhists or good scientists. But the opposite view – that after this body disintegrates, you disappear altogether, is another extreme, another wrong view, called nihilism. As a student of Buddhism, you are not caught in either of these views. There’s only continued manifestation in different kinds of forms; that is rebirth, continuation, in the context of impermanence and no-self. Good scientists see that nothing is born and nothing dies. Suppose you are a cloud. You are made of tiny crystals of ice and water and you are so light, you can float. And maybe floating as a cloud, you encounter a block of hot air so you become drops of water and fall as rain. You go down, you come up again, you go down, and you come up again. Transmigration, reincarnation, rebirth is always taking place in a cloud. And yet a cloud does not need to become rain in order to have a new life. A cloud has a new life every moment. Rebirth, continuation takes place with us in the same way. There is a lot of cloud in us, and we continue to drink cloud every day. Birth and death are taking place in every moment of our daily life. We should not say, “I will die in twenty years, in thirty years;” no, you are dying right in this moment and you are reborn right in this moment. Rebirth is happening in the here and the now – not in the future. So when someone asks you, “What will happen to me when I die?” Ask him or her, “What happens to you in the here and the now?” If you know what happens in the here and the now, you can answer the first question very easily. You are undergoing birth and death right now because mentally and physically you are of a cinematographic nature. You are renewed in every instant, and if you know how to do it, your renewal is beautiful. In every moment we produce thought, we produce speech, and we produce action. That action will have an effect on us and on the world: that is our karma. If you know how to handle your thinking, your speech, and your action, you’ll be more beautiful. You don’t have to wait until you die to see what happens to you. Look in the present moment and you see that birth and death are going on in you at every moment, both in your body and in your consciousness. Every moment of our daily life there is input and there is output. You breathe in, you take food, you have new ideas, new feelings. And things go out from you, like urine, air, and water. So the cosmos is renewing you and you are releasing things to the cosmos. Birth and death does not wait; it is happening now, in the present moment. Suppose one part of the cloud transforms itself into rain and the rain falls and becomes part of a river. The remaining part of the cloud is looking down from the sky and sees its continuation on the earth. It says to its rain part, “I enjoy floating up here but you’re part of me and I hope you enjoy it down there. To be floating up here is nice, but to be flowing down there is also nice.” The cloud is both floating in the sky and flowing as the rain. As a human being, we can see that too. I see myself in my students and in my friends. I wish them good luck, because their good luck is my good luck. When my disciples and my friends carry me with them, I wish them the best. My happiness and suffering depend on them. So when I look, I don’t just see me here. I see me there, and there, and there. I wave and say, “Have a good time in there!” That is the way to look. You see yourself not just in this body, you see yourself everywhere, because every moment you produce thought, you produce speech, you produce action that continues you in the world. One hundred years from now, if you come to Plum Village, you’ll still see me in different forms – and younger and more beautiful! [laughs] Because it is possible to be more beautiful in our way of thinking, in our way of speaking and acting if we know how to generate right view. With right view, we don’t suffer. We can produce thoughts of compassion, understanding, and forgiveness. A cloud can do the work of self-purification up there, so that when it becomes snow or river, it is beautiful. It is possible. We began our talk with the notion that both consciousness and object of consciousness are manifestations of consciousness. Consciousness is a dynamic force that is at the base of manifesting living beings and the world. In Buddhist insight, the world is a manifestation of consciousness. Many scientists have begun to agree that the cosmos is a manifestation of consciousness. As a scientist, you cannot stand outside as an observer; to really understand, you have to be a participant. In Buddhism we speak of karma as the threefold aspect of action; thinking, speaking and acting. When we produce a thought, that thought can change us and can change the world in a good way or in a bad way. If it is right thought, if that thought is produced in line with right thinking, then it will have a healing, nourishing effect on our body and on the world. Just by producing right thinking you can change the world. You can make the world a better place to live, or you can transform the world into hell. That is karma, action; this is not something abstract. For example, the economic crisis is born from our thinking. There is a lot of craving and fear, and the value of the dollar, of the euro is largely created by the mind. Everything comes from the mind. That is why thinking is action and speaking is action. Speaking can release tension and reconcile, or speaking can break relationships. Speaking can destroy someone’s hope and cause that person to commit suicide. Physical action is also energy. There is individual karma that has an effect on everyone. Everything that happened to you happened to the world. You produce that thought, you are affected by that thought, and the world is also affected by that thought. There is also collective karma. During this twenty-one-day retreat, the friendship, the joy, the healing, the transformation is the work of everyone. Each one of us contributes through our practice, through our insight, through our speech. In Buddhism, we do not believe in a God that arranges everything, but we don’t believe in coincidence either. We believe that the fate of the planet depends on our karma, on our action. It does not depend on a God, it does not depend on chance, it depends on our true action. Karma is the dynamic force that underlies everything. I think that scientists will have no difficulty accepting this. Man is present in all things and all things are present in man. Man just arrived yesterday in the history of life on earth. Looking into a human being, we can see our non-human elements, namely our animal ancestors, our vegetable ancestors, and our mineral ancestors. In our past life we were a cloud, and we were a rock. Even in this moment, we continue to be a cloud, we continue to be a rock. There is a mountain in us, do you see? There are many clouds in us, do you see? In a former time, we were fish, we were birds, we were reptiles. And our ancestors are fully present in us, in the here, in the now. We continue as a reptile. We have many reactions that belong to the reptile species. We want to say that we are created by a God in his image. But in fact, we have many ancestors. When a fish swims happily in the water, it is very proud of its talent for swimming. And a fish has the right to say that God must be the most wonderful swimmer in the world. And a rose can say, “God is the most beautiful rose in the world, because he has created me like this.” If you are a mathematician, you tend to think God must be the best mathematician in the world. Your notions of God are anthropocentric. If you are a gay person, you may think that God is the best gay person in the world. Why not? The fish has that right, the rose has that right, so we all inter-are. We continue our ancestors in us now. We are human, but we are at the same time a rock, a cloud, a rabbit, a rose, a gay, a lesbian. We are everything. Let us not discriminate or push away anything, because we are everything. Everything is in us. That’s the right view. If we see that everything is in man and man is in everything, we know that to preserve other species is to preserve ourselves. That is deep ecology, that is interbeing. That is the teaching of the Diamond Sutra. A good Buddhist should be an ecologist, trying her best to preserve the environment, because to preserve the environment is to preserve yourself. Man contains the whole cosmos. On the phenomenal level there seem to be birth, death, being and non-being, but ontologically, these notions cannot be applied to reality. Birth and death are just notions. The true nature of a cloud is the nature of no birth and no death. The scientist Lavoisier says that nothing is born, nothing dies. He agrees completely with this teaching. A cloud manifests as a cloud. There is no birth of a cloud, because before being a cloud, the cloud has been the tree, the ocean, the heat generated by the sun. To appear as a cloud is only a moment of continuation. And when a cloud becomes a river, that is not death, that is also a continuation. We know that there is a way to continue beautifully, and that is to take care of our three aspects of karma – thinking, speaking and acting. Being and non-being are more wrong views. Non-being is a wrong view, but being is also a wrong view. The absolute reality transcends both being and non-being. Before you are born, you did not belong to the realm of non-being, because from non-being, you cannot pass into being. And when you die, you cannot pass from being into non-being. It’s impossible. To be, or not to be – both are wrong views. To inter-be is better. The dynamic consciousness is called karma energy. Karma energy is not abstract. It determines our state of being, whether we are happy or unhappy. Whether you continue beautifully or not so beautifully depends on karma. It’s possible to take care of our action so that we don’t suffer much now and we will continue to do better in the future. There is the hope, the joy. Everything evolves according to the principle of interdependence, but there is free will and the possibility to transform. Free will is mindfulness. When mindfulness intervenes, we are aware of what is going on. If we like our action, we allow it to continue; if we don’t like our action, there are methods to change it with concentration and insight. We don’t want to take a path leading to ill-being; we want to take the path leading to the cessation of ill-being, to well-being. Free will is possible in Buddhism, because we know that we can handle our thinking, we can handle our speech and we can handle our action. We are responsible for our action and it is possible to assure a good continuation. Freedom begins with mindfulness, concentration and insight. With insight, with right view we can practice right thinking. We can change ourselves; we can change the world. Everything is the fruit of action. The one affects the all. The all affects the one. Interbeing means impermanence, non-self, emptiness, and karma. In the teaching of Buddha, every teaching inter-is with every other teaching, so impermanence should be understood as no-self and no-self should be understood as interdependence. No-self and interdependence are not two different things. If you understand interdependence, you understand no-self. If you understand impermanence, you understand interdependence. They are different words, but they are just the same thing. Right view allows right action, leading to the reduction of suffering and the increase of happiness. This is the teaching of the Four Noble Truths and the active aspect of the teaching is the Noble Eightfold Path. Happiness and suffering inter-are. You should not try to run away from suffering because you know that a deep understanding of suffering can bring about insight, compassion, and understanding. And that is the foundation of happiness. We do not think that there is a place where there is no suffering. The Pure Land, the kingdom of God is right here. If we are free, then we can recognize the kingdom of God in the here and the now. We need only a flash of awakening to realize that what we are looking for is already here – the kingdom of God. No birth and no death. Please remember that without the mud, the lotus cannot grow. We should not be afraid of suffering. We know how to handle suffering. We know how to handle the garbage in order to make compost and nourish the flowers. That’s why we can accept this world with all our heart. We don’t need to go anywhere else. This is our home. We want to manifest again and again and again in order to make this home more beautiful with good action. The ultimate reality transcends notions of good and evil, right and wrong. That is the absolute criterion for Buddhist ethics. Judaism and Christianity teach that the world was created by a loving, all-powerful God to provide a home for us. We, in turn, were created in his image, to be his children. Thus, the world is not devoid of meaning and purpose. It is, instead, the arena in which God’s plans and purposes are realized. What could be more natural, then, than to think that “morality” is a part of the religious view of the world, whereas the atheist’s world has no place for values? In the major theistic traditions — Judaism, Christianity, and Islam — God is conceived as a lawgiver who has laid down rules that we are to obey. He does not compel us to obey them. We were created as free agents, so we may choose to accept or to reject his commandments. But if we are to live as we should, we must follow God’s laws. This conception has been elaborated by some theologians into a theory about the nature of right and wrong known as the Divine Command Theory. Essentially, this theory says that “morally right” is a matter of being commanded by God and “morally wrong” is a matter of being forbidden by God. That Man is the product of causes which had no prevision of the end they were achieving; that his origin, his growth, his hopes and fears, his loves and his beliefs, are but the outcome of accidental collocations of atoms; that no fire, no heroism, no intensity of thought and feeling, can preserve an individual life beyond the grave; that all the labours of the ages, all the devotion, all the inspiration, all the noonday brightness of human genius, are destined to extinction in the vast death of the solar system, and that the whole temple of Man’s achievement must inevitably be buried beneath the debris of a universe in ruins—all these things, if not quite beyond dispute, are yet so nearly certain that no philosophy which rejects them can hope to stand. Only within the scaffolding of these truths, only on the firm foundation of unyielding despair, can the soul’s habitation henceforth be safely built. (Bertrand Russell, “A Free Man’s Worship,” 1902). The universe is some 15 billion years old — that is the time elapsed since the “big bang” — and the earth itself was formed about 4.6 billion years ago. The evolution of life on the planet was a slow process, guided largely by natural selection. The first humans appeared quite recently. The extinction of the great dinosaurs 65 million years ago (possibly as the result of a catastrophic collision between the earth and an asteroid) left ecological room for the evolution of the few little mammals that were about, and after 63 or 64 million more years, one line of that evolution finally produced us. In geological time, we arrived only yesterday. But no sooner did our ancestors arrive than they began to think of themselves as the most important things in all creation. Some of them even imagined that the whole universe had been made for their benefit. Thus, when they began to develop theories of right and wrong, they held that the protection of their own interests had a kind of ultimate and objective value. The rest of creation, they reasoned, was intended for their use. We now know better. We now know that we exist by evolutionary accident, as one species among many, on a small and insignificant world in one little corner of the cosmos. The details of this picture are revised each year, as more is discovered; but the main outlines seem well established. (James Rachels, The Elements of Moral Philosophy, McGraw Hill, 2007). Both subject and object of perception manifest from consciousness according to the principle of interbeing. Man is present in all things and all things are present in man. On the phenomenal level, there seems to be birth, death, being and non-being, but ontologically, these notions cannot be applied to reality. The dynamic consciousness is called karma energy. Everything evolves according to the principle of interdependence, but there is free will and the possibility to transform; there is probability. The one affects the all, the all affects the one. Interbeing also means impermanence, non-self, emptiness, karma, and countless world systems. Right view allows right action, leading to the reduction of suffering and the increase of happiness. Happiness and suffering inter-are. The ultimate reality transcends notions of good and evil, right and wrong. (Thich Nhat Hanh, Winter Retreat of 2008). By the end of the retreat, several long-time practitioners — including monastics — told me that this was their best retreat ever. Here in Colorado we have been fortunate to have had two monastic retreats, in the summers when Thay did not come to the US. So we know what incredible Dharma teachers we have among our monks and nuns. This was one of the blessings of this retreat — we had the great fortune to hear some voices we normally do not get to hear. Thay Phap Niem gave a powerful Dharma talk on no birth no death; Sister Chau Nghiem, Thay Phap Dung, Sister Tue Nghiem and others gave memorable talks; and a panel of lay and monastic Dharma teachers did a masterful job of answering questions. Thay continued in his letter: “In this retreat, you will witness to the talent of the Sangha: you will see that Thay is already well continued by the Sangha, and the presence of the Sangha carries Thay’s presence. Please let me walk with your strong feet, breathe with your breathing lungs and smile with your beautiful smiles.” This is our summons to carry Thay with us always. I believe that our Sangha is vibrant and powerful enough to ensure Thay’s continuation, a continuation in beauty. The Colorado retreat was proof of that. Please send us your stories and photos from the U.S. tour as soon as you can; we will feature some of them in our upcoming issues. However, I am sad to say that I will no longer be editor of the Bell. I am moving on to other adventures, starting with a course in storytelling at Emerson College in England. Editing our Sangha’s journal has been a joy and a privilege. Allow me to express my deep gratitude to all who contribute to making this magazine a reality: our talented staff, David Percival, Helena Powell, Brother Phap Dung, Sister Annabel; and wonderful volunteers Barbara, Matt, Judith, Elaine, Brandy, Richard, Peggy. It has been an honor to work with you. And to all who have participated these past four years — writers, photographers, subscribers, donors — I bow to you all. It’s been a delightful journey. I will miss you very much, but I will continue to enjoy you through these pages — and you may see one of my stories now and again. May you be well in body and spirit. May you meet adversity with courage and grace. May you rejoice in the love that surrounds you always. Sangha Building This latest issue of the Mindfulness Bell is just bursting with treasures for Sangha practice (as well as a very helpful article on the aspirant training process!). It really helps those of us with young Sanghas and provides us with inspiration and direction with wonderful examples from practice. Thank you for putting this issue together for us! Thank you for focusing on the topic of Sangha building. Bliss Run Mindfulness Community in Columbus, Ohio just turned one year old. The stories featured in the Bell were both inspirational and informative. Our Sangha has experienced flooding in our room while we were meditating, finding ourselves locked out of the building, having our meeting room turned into a storage room, and dealing with some hostility from people who are suspicious of meditation groups. We have had “key” people disappear, for no apparent reason. We have had people come for only one time, despite our deep commitment to welcoming people with warmth and enthusiasm. Nothing has deterred our core group of six people. As Thay encourages us to focus on Sangha building, I sometimes find myself struggling. I know that even when we only have six people attend, that’s enough, as Thay also reminds us. Yet, there is a part of me that longs to have a greater attendance. Craving lurks just around the corner, even in the meditation hall. Yet, with each issue of the Bell, I am reminded that I do sit with a worldwide Sangha that includes people from all corners of the globe. Sangha building is not a numbers game. It is a way of life. Last May we had a wonderful retreat with Thay in the Netherlands. We sold a lot of books, DVDs, and CDs in our bookshop. From the revenue we would like to send € 1000 [$1420] for issues of the Mindfulness Bell for prisoners. Greet, this is really generous of The Netherlands Sangha and we are indeed grateful for your support. Please let all of your members know that we deeply appreciate their assistance. And many prisoners stuck in some lonely prison will also be grateful as this allows us to bring the practice to them and help them to deal with their suffering. We frequently hear from prisoners about how the Mindfulness Bell makes a real difference in their lives and how they usually share each issue with other prisoners. Bows and smiles to you and The Netherlands Sangha. Another year has passed and once again I’ve been offered an extension on the gift subscription to the Mindfulness Bell that I was given years ago. Through the kindness of others the Dharma is shared with prisoners such as myself. Thank you and all those who make the Dharma available to others in need. I can’t imagine a greater gift. Last year my reply to your subscription offer was printed in an issue of the Mindfulness Bell. As a result I received a kind letter from a fellow reader, ex-prisoner, and Dharma brother, John C. He has been a wonderful source of information regarding Buddhist history and practice, and is but one of the many treasures that have come into my life as a result of my study and practice. Today, in many ways, I am more free than I have ever been. The gift of the Dharma has given me what I never thought possible: Peace. To you and countless others who share the Dharma, I say again, thank you. I am in your debt. First, let me thank you for continuing to send the Mindfulness Bell. I share it around among other inmates here and we all love reading the magazine. And it has helped me so much with my practice. Once again thank you for your support, concern, and love. Thank you very much for caring for me and for allowing me one more year’s subscription to the Mindfulness Bell. It means a lot to me, really it does. I would be most grateful if you would renew my subscription to the Mindfulness Bell. It’s such a blessing to receive information and news on the Dharma, Sangha, and those who spread the seeds of love. I really enjoyed the Prison Sangha article in the Autumn 2008 issue. It inspired me to make a cell Buddha. I can pull him out when I am in need of his calming presence. I found deep satisfaction in reading Sr. Chau Nghiem’s article, “Resurrection in the Present Moment” (Winter/Spring 2009). It was inspiring how she was able to move beyond the judgments and racism that were bestowed upon her. Even from her own grandparents. What can I say, I was touched. And as always Thay’s words set my mind at ease and put a smile on my face. This is exactly what it is like. About 600 of us from fifty countries are in Plum Village for the June retreat. To help people connect and feel solid, we form “families” of about twenty people. In my Oceans of Peace family, we are from Denmark, Viet Nam, Hong Kong, North Carolina, Wales, the UK, Berkeley, Botswana, Scotland, Germany, the Netherlands… and Lopez Island, my home off the coast of Washington State. The weather is steamy-hot midday, but mornings are blessedly cool. The large pink-petal lotus flowers are just opening, a few lazy frogs lounge on the shiny green lily pads, the sun is still gentle and easy. By 9:00 a.m. we’ve all arrived at the meditation hall for Thay’s Dharma talk. Quietly we slip off our shoes and enter in noble silence. The hall is simple. At one end, two sticks of incense burn on a Buddha altar. Up front, a simple vase sits next to Thay’s cushion with a sprig of flowers and a tray with one small teapot and cup. Cushions and mats are arranged in a large semi-circle with chairs behind. I enjoy hearing the comforting rustles and whispers as lay friends and monastics settle in. Those who don’t speak English plug their headphones into audio boxes for translations of Thay’s talk. The ting-ting-ting of the small bell announces Thay’s arrival. Everyone stands and joins their palms. Our teacher enters the silent hall and walks to his cushion in the center of the front row. He turns to the Sangha and bows. We return his bow, and all sit down. Thay likes to write on the whiteboard when he talks. I enjoy watching him erase the board. He pauses, quietly stands up, and walks mindfully to the board. Then he picks up the eraser. There is not a sound in the Dharma hall. Hundreds of us, totally silent. It’s easy to smile, relax, and enjoy the peaceful moment. Thay slowly wipes away the words, making a clean space for new writing. I feel calm, free from speed, free from wanting anything, enjoying watching the eraser make wide, peaceful arcs across the board. Thay is teaching about practicing right diligence: ways to stay safe in a fast world. At Plum Village, the monastics have a way to use the Internet while not getting caught in its energy. They ask another brother or sister to sit beside them while they are online. In this way they are part of the world, but safe, too. Thay paints beautiful calligraphies which are sold in the bookshop to raise money for special projects. The newest is “Breathe, you’re online.” How cool to have a teacher who, at age eighty-three, uses the Internet to share the Dharma! One of Thay’s themes in this retreat is joy. He talks about the Buddha’s teachings on the Four Noble Truths, reminding us that the first truth is that life contains suffering. But, he says, we concentrate too much there. The second truth is that there is a path to suffering; the way we have been living has brought suffering to us. Remove the cause and the effect will vanish. The third is that there is joy, an end to suffering, and it is the absence of darkness, the presence of light. The fourth noble truth is that there is a path to that joy. The old language, from the time of the Buddha, calls the third noble truth the cessation of ill-being, but Thay’s teaching is clear: let us call this by its true name, joy! Let’s find a way to make this wonderful teaching available to everyone. The world needs our help. “Dear friends, please be the best practitioners you can be. That is why we live our life in mindfulness and concentration: it is for our own liberation. With that, we can help to liberate the world. How do we bring up this feeling of joy? We make use of our breathing. We return to the present moment so that insight, knowledge, and awareness will bloom, and joy will be possible right away. We don’t have to be excited any more. Our joy can be calm and peaceful. This is true joy. After the Dharma talk, we wander around the grounds. It’s nice to seek a soft patch of grass by the lotus pond or a wisp of shade. The monks show us where to pick juicy black mulberries from the trees. The nuns are selling little treats to raise money for needy children in Vietnam. We gather at their tables, choosing sweet crepes served on fat green leaves, warm sesame balls (oh, the doughy goodness! ), and squares of carroty cake. The big bell calls us for walking meditation. We gather in one huge circle, monastics and lay friends side by side. Someone begins singing, “Happiness is here and now, I have dropped my worries. Nowhere to go, nothing to do, no longer in a hurry.” More little songs follow with simple words, melodies, and hand motions. We sing in French, German, Dutch, Vietnamese, and Spanish. Years ago I felt a little goofy singing like this, but now these songs awaken my tender heart. I feel like a happy kindergartner, safe in a circle of friends. After we sing half a dozen songs, a hush falls on the group. Like flowers turning toward the sun, the circle opens as Thay joins us. We join our palms and bow. Taking two children by the hand, he starts making slow, mindful steps. Imagine the extraordinary sight: 600 people silently walking step-by-gentle-step around the lotus pond, through the stately rows of poplar trees, into the forest, down beside the creek, and finally back to the hamlet. We walk for forty-five minutes, flowing in a silent Dharma river. Lorrie Harrison, Compassionate Listening of the Heart, is a founding member of the Morning Light Sangha on Lopez Island in Washington State. A professional writer, she lived and practiced near Plum Village for five months over the summer. By Thich Nhat Hanh Responding to questions from lay friends on June 13 during the Path of the Buddha retreat, Thay spoke about supporting President Obama and assisting those in need across the globe. Many of us are very pleased to have Obama as president of the United States of America. I have not seen any politician like him who knows how to use loving speech, to speak in a humble way. The presence of Obama also tells us of the presence of a group of people who agree with him — not only Americans but also Europeans, Africans, and Asians. This is very important. Obama, with his good intentions and his nonviolent approach to the problems of the planet, did not just happen. In the past forty or fifty years many of us have been working ceaselessly to sow the seeds of peace, reconciliation, and preservation of the planet. Sometimes we have felt that the work has not brought any results. But then the increased suffering and despair helped to wake people up and to see there is another way to deal with conflict in America and the world. On Obama’s inauguration day, we felt hope. We want Obama to succeed; whether we are Americans or non-Americans we have invested in him and we are afraid that he will not succeed. In order to help him, we have to organize ourselves. We have to strengthen our Sangha, and the Sangha in America. Wherever we are, we can always do something to help. Obama may not call his team a Sangha but it is a Sangha. If not they are not capable of preserving their compassion, insight, and determination, they will not be able to help Obama, and then Obama will disappoint us. I think President Obama doesn’t need to come to Plum Village and follow a retreat; he got his training somewhere in his own way. He used the word “mindfulness” in his inauguration, and in his speech at Cairo University he used “beginning anew.” He said, “I want to have a new beginning with Islam.” He knows how to use loving speech. Maybe he does not need formal training but he needs a strong Sangha surrounding him and helping to support him. We all want to help people in Tibet and Burma and other places throughout the world. Forty thousand children die every day because of the lack of food and nutrition. Many of us are aware of that; and yet not many of us do anything to help. How can we reach out and help these children who are dying? How can we reach out to our brothers who feel left alone in the struggle for democracy and independence? The problem is that we are so busy. We are running to get what we want. We have no time, no energy: that is the main obstacle. How can we rearrange our lives so that we have time to help our brothers and sisters who are caught in difficult situations? We should liberate ourselves from our too-busy lives. We have to reorganize our lives, individually and collectively, in order to be with each other in a more intimate way. We can begin with Sanghas. 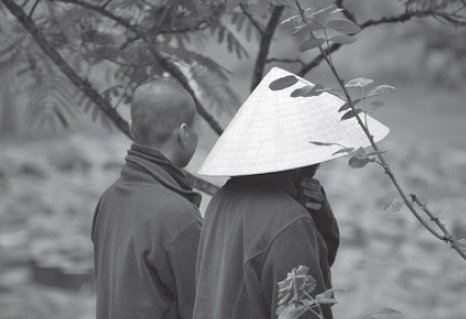 Members of a Sangha belong to society and have jobs, family, community, aspirations, and plans. But we still find a way to come and sit together for twenty-one days. If other people make an effort they can do the same. Imagine for twenty-one days all the cars stop. We don’t eat the flesh of animals. We enjoy the fresh air, the song of the birds. We allow our bodies to release tension; we listen to the sound of the bell. We cultivate brotherhood and sisterhood. We are truly making peace within ourselves, making peace with the environment and with one another. If 500 people can do that, other groups can do it also, whether they are Christians, Muslims, or Jews. What we do here we are not doing for ourselves alone. We do it for everyone. We show people that another way of life is possible. They can release their habit energy, slow down and begin to change so that they have more time for themselves, for their family, for members of their Sangha. And then naturally problems like those concerning the hungry children, the environment, Burma, Tibet, will be more easily solved. A Buddhist retreat at Plum Village is unlike any other Buddhist retreat (as far as I know). There’s relatively little sitting meditation, which surprises and disappoints some folks. But there are lots of other forms of meditation — in fact the practice of mindfulness means meditating twenty-four hours a day, no matter what we are doing. The point, of course, is to teach us how to do this in daily life, out in the “real” world. There are two particularly ingenious methods that Plum Village has devised for teaching the practice of mindfulness. The first is working meditation. At the Path of the Buddha retreat, I was in the francophone family with my friend Pascale and my mentor, Sister Dao Nghiem. Our job for the three-week retreat was to clean the bathrooms in Lower Hamlet. Hence our name: Delicate Fragrance. Working with people every day, you get to know who likes to scrub every corner and who would rather pick flowers for the sinks. Who has a bad back but doesn’t want to complain. Who stops to chat (and chat and chat), who’s cheerful no matter what, who’s grumpy. Who wants to tell people exactly how to do everything (me) and who on the second day realizes that grown women know how to clean bathrooms and can decide among themselves who’s going to do what (me again). You learn a lot about other people, but mainly you learn about yourself, in the context of community and activity. Being as how most of us live and work with others, these lessons come in very handy once we return home. The other ingenious device to teach mindfulness on retreat is the skit. Most Vietnamese people love to play; and since their culture was only recently infected with modern technology, they still enjoy old-fashioned homegrown entertainment. So at the end of every retreat there’s a grand performance. Fortunately, we’re doing the performances within each hamlet rather than all 600 of us together. After living together for three weeks, Lower Hamlet feels like one big family. Which is a good thing, because there’s nothing that brings up people’s neuroses like the idea of performing in public. Unlike most families, we started working on our skit the very first week. Serge, the one man among twenty-three women (our hamlet hosts women and a few couples), proposed a lovely old French folk song that someone had rewritten into a Plum Village song, “On the Road to Plum Village.” We decided to rewrite the song again with a story about us: arriving at Plum Village all tired and stressed out, then cleaning toilets and showers together, finally finding freedom and happiness. At the end of the second week it all turned sour. We’d been rehearsing every day, and had the music down pretty well but were getting tired of it. Hélène, who happens to be a fabulous singer, arrived at the retreat two weeks late. That evening she sat down with the only two people who still wanted to rehearse and she taught them a slightly different version of the tune. And the three of them came up with a new way of performing it. The next evening after dinner we started to rehearse, and all hell broke loose. Ah non non non! On recommence pas à zéro! No, we’re not starting over, someone huffed and stomped off. Others shook their heads in disgust and did not return from cleaning their dishes. The rest of us regrouped, decided to put the song mostly back the way we had it, and had a great time singing our hearts out and laughing. The next day we started adding the skit. It had been my bright idea to have actors pantomime what the words were saying. (No one in our audience was going to understand our song, because it was in French! The other 140 retreatants at Lower Hamlet were British, Dutch, German, American, with a few Italians.) From the supply closet by the kitchen, I had collected all kinds of props — new brushes, sponges, mops, spray bottles — all stashed in a suitcase for the first part of the skit. Don’t you just wish that after all these years of listening to Dharma talks, meditating, paying therapists, going on retreat — don’t you wish you could stay enlightened for more than thirty seconds at a time? When it came time to create the little skit, just three minutes of pantomime, my ego came out to play. Big time. Because I had some really good ideas! Brilliant ideas! Every morning and every evening in meditation, in the deep stillness of the meditation hall, it was the first thing that sprang into my mind: Sur la route des Pruniers... I saw our three nuns doing this, and our lay friends doing that in the next verse, and a stupendous finale with everybody dancing... as stunning as the Rockettes of Radio City Music Hall. When it came time to rehearse with our family, my overbearing enthusiasm was not well received. Beatrice was a little miffed that I had wrenched all the fun stuff away from her. And the actors never managed to come together at the same time: Andréa got sick, Géraldine had to make an emergency trip to care for a friend, Josslyn had somewhere else to be after Dharma discussion. But the obvious reason that it didn’t come together is that it was supposed to be a collaboration. Silly me. Day after day, I dealt with my feelings and frustrations — looking deeply in meditation, stepping back when rehearsals weren’t going well, letting go, letting go. Thank goodness the performance was pushed back to Thursday. On Tuesday Sister Dao Nghiem, who had left us to our own devices, initiated a rehearsal. The two groups sullenly stood facing each other in a semicircle and half-heartedly sang: Sur la route des Pruniers... The nuns walked through the center as we had scripted. The actors feebly acted out our part. With only a little squabbling in the middle, we limped to the finale. Sister Dao Nghiem calmly admonished us to relax a little bit and have fun. Then she redesigned the ending, adding some peaceful walking in pairs rather than our manic scurrying and jumping. We performed it a few more times but our hearts weren’t in it. The big day came. We rehearsed before dinner, but it wasn’t going very well. I was disgusted with myself for getting so hung up on the whole thing, for not being able to communicate my ideas effectively, and especially because my magnificent finale had been scrapped. Finally I decided to just throw myself into it. What did I have to lose? I banished my ego once and for all and joined in the fun. We were nervous, we were excited, we were enjoying ourselves again. Then Hélène said, “Attendez, j’ai une idée! Wait, I have an idea!” We all screamed. She was joking of course. Béatrice suggested next time we do a skit we should call it “I have an idea!” We all laughed; we knew exactly what she meant. That night in the meditation hall we were one of the last acts to perform. There were five or six before us, all funnier and more inspired than the last. The pot-washing family pounded tubs and pans for an energetic percussion piece, accompanied by nuns and laywomen waving big pot lids in a traditional Vietnamese hat dance. The vegetable-chopping family did a skit about having to work in silence (Delicate Fragrance conveniently forgot about the practice of silent working meditation). When it came our turn, yes, you guessed it — we pulled it off! Our fellow retreatants laughed and clapped along to our silly song. We exited the stage area breathless, joyful, eminently pleased with ourselves. Someone from another family later remarked on how much harmony there was in our family. We laughed our heads off when we heard that. But there was harmony. A far deeper harmony than when we started. During the worst of it, when some people disappeared from the family for a day or two and our dinners together were glum, Sister Dao Nghiem told us that harmony does not mean the absence of conflict. You can have differences — in a community there will always be differences — but still you have harmony because you care about one another. You want it to work, so you do whatever it takes. In fact, I believe those very difficulties are what knit the community into a harmonious whole. How else would we get to know one another deeply, to know ourselves? That’s why Thay says he wouldn’t want to go to a heaven where there’s no suffering. It’s in those cracks that healing occurs. It’s when our heart breaks that we learn how to love. That’s the whole point of the skit — aside from motivating us to relax and play, us Westerners who can take the whole thing so seriously. It’s fi to feel peaceful and loving when you’re sitting on a cushion or walking in the woods or eating with friends in silence. But try to do something together and that’s where the real practice begins. Janelle Combelic, True Lotus Meditation, practices with Lotus Blossom Sangha in Longmont, Colorado. Beneath the pine trees, beneath the midnight moon I lay; a flat minstrel. Composing, de-composing. By Nancy Lee Koschmann I have two Sanghas in my life. My home Sangha is a group of mostly working, middle-class people like myself who have discovered Thay’s writings or have attended retreats with him. My other Sangha is composed of inmates at a nearby men’s maximum security prison who have difficulty even acquiring Thay’s books. On Friday mornings I sit as a volunteer with the prison Sangha, hopefully providing support and encouragement to the inmates as well as the official leaders, a nun and her assistant from the Syracuse Zen Center. Recently we held two partial day sittings — the first in the history of the prison — during which the men who gave the Dharma talks spoke of the immeasurable comfort and strength they drew from our small but committed prison group. While my home Sangha plays a central role in my life, the prison Sangha has also become a place of deep motivation and supportive connectedness. It has offered me valuable Dharma lessons, companionable meditation, and regular guidance in mindfulness. If that is true for me, think how true it must be for my incarcerated Dharma brothers who have very little else in their lives. Thus I think a great deal about Sangha building in prison, wondering how to create a supportive Buddhist community within those tall, thick stone walls. One way, I believe, is to maintain contact with Sangha on the outside, but prison regulations make that very difficult. Those of us from the outside try to bring in materials from our home and affiliated groups: magazines, newsletters, and thoughtful writings. We have to get permission for any items we bring; in addition we must arrange several days in advance to have everything listed on a gate pass. We are in the process now of getting approval for several volunteers so that they can visit the Sangha as embodied proof that those on the outside care and know about the men. The process includes forms, background checks, fingerprinting, and a great deal of time. While maintaining the strength of our little prison Sangha is crucial, equally important is the effort to reach out and include other inmates in our practice and our services. Prison regulations in New York declare that each inmate may designate only one religion and attend only one type of service. This is, of course, rather antithetical to the way Thay has taught us to think of the Dharma, but there seems no way around the rules at present. To change affiliation is to call attention to one’s self — not a good thing to do in a prison environment where, as the Japanese saying goes, the nail that sticks up gets hit on the head — so unless people are unusually motivated, they are unlikely to request a change. Inmates are allowed to attend a religious service as a guest three times, but for most people this is not enough exposure to determine whether or not they want to change affiliation and forgo the formal services of their root tradition. Last summer I decided to offer a course on Buddhism so that more inmates might have an opportunity to explore the ideas and practice of meditation. I offered a four-week course on “The Science and Practice of Meditation,” and while the men seemed to enjoy it and attended regularly, it was much too short to scratch the surface of either the science or the practice! This term I am doing a fourteen-week course, entitled “Introduction to Asian Meditation.” We are fortunate to have the official backing of both the Cornell Prison Education Program and Cornell University’s East Asia Program to help pay for books and photocopying. My local Sangha paid for the first course’s texts, Be Free Wherever You Are and The Heart of Understanding by Thich Nhat Hanh. Will any of these men join our prison Sangha? I don’t know. But what I do know is this: the men in the Sangha are encouraged to know that there are others out there in the cell blocks who are at least exploring the same path. I remind my students often that this is a class about Buddhism, with some practical experience in meditation, but that it is not a class that aims to “convert” anyone. Meditation, I tell them, is part of all religious traditions and if they practice, they will learn more about themselves, about others, about compassion and how to handle destructive emotions and be free and peaceful wherever they are. The teachings are about a more skillful and peaceful way to live. Yes, I hope they come to our Sangha, at least to visit, but whether they do or not, I believe I am contributing to the real meaning of Sangha: a broad community of people walking the same path — whether we call ourselves Catholic or Sufi or Jew or Zen Buddhist, whether we are in prison or on the outside. In such a Sangha, there are no stone walls. Nancy Lee Koschmann, Opening the Path of the Heart, taught psychology and women’s studies for twenty-five years; she is now a life coach and volunteer who practices with Cedar Cabin Sangha in Ithaca, NY and ShoShin (Beginner’s Mind) Sangha at Auburn Correctional Facility, Auburn, NY. A decade ago, on the infamous exercise yard of San Quentin State Prison, an inmate sat upright by himself along the fence. A few close friends approached and asked what he was doing. He said he was practicing Zen meditation, and they sat down with him. All of them were older inmates, “lifers” who were serving long sentences, all veterans of the war in Vietnam. Eventually, under the auspices of the San Francisco Zen Center (SFZC), they established a congregation fully recognized by the California Department of Corrections and Rehabilitation. Now, for two hours every Sunday evening, as many as thirty inmates gather in a well-heated classroom to practice as the Buddhadharma Sangha. In the prison industries workshops, they’ve expertly crafted an altar, cushions, pads, and benches, and on the chalk-tray of the blackboard, they set a framed calligraphy by Thay — The kingdom is now or never. The SFZC facilitators regularly ask the men to prepare talks that focus on their practice and then to respond to follow-up questions from the Sangha. Many of the men are mature, insightful practitioners. When the SFZC officials are unable to attend, they sometimes ask members of the Community of Mindful Living [Editor’s note: Sanghas in the tradition of Thich Nhat Hanh] to facilitate. They appreciate our being there; their practice brings us joy and inspiration as well. The men like our practices of listening to the big bell, mindful eating, and especially Dharma discussion. For the Dharma talks, we ask the men to suggest topics in advance, and we invite an inmate to give the talk alongside us. They have a library with several books by Thay. After we had showed up with some regularity, the inmates said they were interested in learning some of our practices, so we arranged an extended period of practice — a Day of Mindfulness at San Quentin. We provided homemade picnic lunches for everyone, and some said it was the first time in years that they had fresh raw vegetables. On Monday, February 16, 2009, amidst heavy rain and strong wind, the fifth annual Day of Mindfulness was held in the Buddhadharma Sangha at San Quentin State Prison in California. Mindful living, the practice of complete awareness, is based on the teaching of Vietnamese Zen Master Thich Nhat Hanh, who has founded several Mindful Living communities located around the world. “Mindfulness gives us the tools to live our lives in peace in the midst of prison chaos,” inmate Russo said about the practice. “Although this event was a Buddhist Religious program, the cornerstone of our practice has always been ‘we are here for anyone, of any belief’,” Russo added. Most of the visitors are involved in mindfulness and meditation programs in various jails, prisons, or community centers in Northern California. They are proactive in their practice, which radiates into the community. The Buddhadharma Sangha was established almost ten years ago. Five inmates spent a year, rain or shine, sitting in meditation on the lower-yard. On September 5, 1999, in the midst of a partial lockdown in the prison, the Sangha held its first service with Zen priest Roshi Seido Lee de Barros, from Green Gulch Farm in Marin County. At the end of the day, as the rain and gusty wind momentarily subsided, the group gathered in a circle and shared a song together amid tears and the feeling of gratitude experienced throughout the day. “I fully understand now why you all come here,” said inmate Thao, on his second day with the Sangha, as he walked back to the housing units. It was wonderful day for all of us, because we all have so much to learn. Caleb Cushing, True Original Commitment, practices with the Pot Luck Sangha and the Open Door Sangha in the East Bay Area of Northern California. According to the Lionheart Foundation, the U.S. criminalizes and imprisons more people than any other country in the world. It has over 2 million people in prisons, six to ten times as many as any other nation. Three-quarters of these prisoners have a history of drug or alcohol abuse and one-sixth have a history of mental illness. One out of every three black men between the ages of 20 to 29 are in prison or on probation. In the last twenty years more than 1,000 new prisons have been built. Abbott Kinloch Walpole of the Gateless Gate Zen Center in Gainesville, Florida says the prison-industrial complex is a “confluence of interests,” which depends on a steady supply of prisoners from which money and property can be harvested. Politicians and judges to be “electorally viable” must help supply prisoners. Not only their jobs but the jobs of many judicial, police, and prison officials depend on having lots of prisoners. In Florida there is nothing for prisoners to do in prison but to take psychotropic pills to deal with their brutal situation. He says if you want to know what prison does to prisoners read holocaust survivor Viktor Frankl’s 1946 book Man’s Search for Meaning. Many Sangha sisters and brothers are writing to prisoners. Others are facilitating prison meditation and Dharma courses. Other practitioners are working to prevent the executions of prisoners and the daily abuses inflicted on them, or to change draconian penal policies and practices through human rights organizations. “Restorative justice” programs are being established where criminals, crime victims, and communities work together to heal the damage caused by an offender. Others are working on “re-entry” policies and programs to help prisoners when they are released. While others are helping the families of prisoners, particularly their children; or working to prevent young people from going to prison. There are also efforts to educate and inform the public and community leaders about hellish prison conditions, a need to end the criminalization of the poor and minorities for behaviors that are not crimes, and the destructive results of the prisonindustrial complex. Many Sanghas do excellent work with prisoners in their communities and only a few are listed here. At the forefront of Buddhist efforts, two organizations stand out: the Buddhist Peace Fellowship Prison Program and the Prison Dharma Network (PDN). Sitting Inside: Buddhist Practice in American Prisons by Kobai Scott Whitney, explains what it is to be a prisoner and practicing in prison. Available from the Prison Dharma Network for $15. Write to PDN, P.O. Box 4623 Boulder, CO 80306. Or order online at www.prisondharmanetwork.org. Be Free Where You Are by Thich Nhat Hanh (Parallax Press). A Dharma talk at the Medium Security Prison in Hagerstown, Maryland. Doing Your Time with Peace of Mind: A Meditation Manual for Prisoners Provided free to prisoners in English or Spanish by the Heart Mountain Prison Project, 1223 So. St. Francis Drive, Suite C, Santa Fe, NM 87505. Download it from heart-mountain.org/NewFiles/Booklets.html or email dougbooth4@gmail.com. Dharma friend Amy Davis reads the entire fourteen-page manual, answering commonly asked questions about meditation, and provides instruction in five basic meditation styles. The tapes are free to inmates. Prison Dharma groups are asked for a donation of $1 per cassette, but no requests are refused due to lack of funds. The cassettes are “prison-friendly” – housed in clear plastic cases with clear shrink-wrap, molded together without screws. Dharma in Hell by Dharma Teacher Fleet Maull. A former federal prisoner tells about imprisonment “in the charnel ground” of America’s prisons, and his fifteen years there living a life of vows and service, and thus bringing compassion and transformation into this hell realm. Available from the Prison Dharma Network, PO Box 4623 Boulder, CO 80306, or online at www.prisondharmanetwork.org. Buddhist Peace Fellowship Prison Project P.O. Box 3470 Berkeley, CA 94703 Tel: (510) 655-6169 ext. 307 E-mail: prisons@bpf.org Web page: www.bpf.org The project started in 1998 to help all persons associated with the prison system through advocacy, education, ministry, and training. Has a prisoner pen pal program. Sends the BPF journal Turning Wheel and Dharma books to prisoners. Prison Dharma Network P.O. Box 4623 Boulder CO 80306 Tel: (303) 544-5923 E-mail: pdn@indra.com Web page: www.prisondharmanetwork.org/PDN An international non-sectarian contemplative support network for prisoners, prison volunteers, and correctional workers founded in 1989 by Fleet Maull, a former prisoner. Has an online discussion group. Publishes books and materials relating to prison Dharma and the PDN’s Volunteer Training Manual on how to start a prison Dharma program. Unified Buddhist Church (Thich Nhat Hanh) Prisoner Outreach Deer Park Monastery 2499 Melru Lane Escondido CA 92026 Tel: (760) 291-1003, Fax: (760) 291-1172 Web page: www.deerparkmonastery.org. Mindfulness Bell Subscriptions c/o David Percival 745 Cagua SE Albuquerque, NM, 87108-3717 Tel: (505) 266-9042 E-mail: dperciva@unm.edu Monastics at Deer Park Monastery are working with David Percival at the Mindfulness Bell and staff at Parallax Press to send magazines and books to prisoners. They are looking for lay practitioners to help in corresponding with prisoners. For those already writing to prisoners please note that issues of the Mindfulness Bell can now be downloaded at www.mindfulnessbell.org/download_mb.htm and sent to prisoners. North Carolina Prison Sanghas For more than fifteen years the Charlotte, NC Sangha has been supporting prison inmate Sanghas in the North Carolina Department of Corrections. Contact Leslie Rawls at sangha@charlottemindfulness.org. Boston Old Path Sangha The Old Path Sangha and its sister Sangha in Salem and Marblehead, Massachusetts have been supporting a meditation group at the Boston Suffolk County House of Correction for many years. Contact Rich Geller at rgeller@meditationprograms.com. Gateless Gate Zen Center 1208 NW 4th Street Gainesville, Florida 32601 Tel: (352) 336-1517 E-mail: gatelessgate@hotmail.com Web page: www.gatelessgate.org Abbott Kinloch Walpole has developed a program for prisoners to deal with imprisonment and post-imprisonment based on the Mindfulness-Based Stress Reduction (MBSR) developed by Jon Kabat-Zinn of the University of Massachusetts Medical School Pain Center. Prisoners participate in week-long meditation trainings in prison and when released live in residential monastic houses. He also visits Florida’s death row prisoners. The Lionheart Foundation P.O. Box 194, Back Bay Boston, MA 02117 Phone (781) 444-6667 E-mail: questions@lionheart.org Web page: www.lionheart.org Sponsors the National Emotional Literacy Project for Prisoners and the National Emotional Literacy Project for Youth-at-Risk; and distributes free to prison libraries and programs the book: Houses of Healing: A Prisoner’s Guide to Inner Power and Freedom. Amnesty International USA www.aiusa.org An international organization working to stop the human rights abuses, torture, and execution of prisoners. International CURE www.CUREnational.org An international organization working for criminal justice reform. Has state chapters. Human Rights Watch www.hrw.org An international organization working for human rights, including those of prisoners. Center for Constitutional Rights ccrjustice.org A national organization working for the constitutional rights of all people in the USA, including prisoners. The American Civil Liberties Union www.aclu.org A national organization working for the civil liberties of all people in the USA, including prisoners. National Coalition to Abolish the Death Penalty www.ncadp.org A national organization working to end the use of the death penalty in the USA. Bill Menza, True Shore of Understanding, is a Dharma Teacher who practices with the Florida Community of Mindfulness. I don’t know how to explain my cat’s curious sweet friendship with our concrete Buddha. Isis loves the sound of the bell. When she hears the sound of the bell signaling the beginning of our morning sitting, she comes into the room already purring. She begins by rubbing up against my husband John and me, each of us in turn, sometimes putting her paws on my chest and bringing her nose right up to my mouth just close enough that I can feel the soft fuzz of her chin. Then she settles in front of me, conforming her body to the fold of my legs. She does not stir until the sound of the small bell and we move to stand up. When Bill Menza, True Shore of Understanding, came to visit last spring, he brought a lovely Buddha statue for our yard. I was astonished to watch Isis exhibit the same behavior with the statue. The first time I let her outside, she ran right to the statue as though greeting an old friend. It has become a regular ritual. She rubs her body all over the Buddha, brings her nose right to his mouth as though savoring his breath, and eventually climbs into his lap or drapes her paws over his legs. I have even seen her pat his face affectionately with her paw. Cheri Maples received the Lamp Transmission from Thich Nhat Hanh and became a Dharma teacher on January 9, 2008 at Plum Village. Here is part of the Dharma talk she gave to the Sangha that day. Since I was very young, I have had a passion for justice, which led to my work as a police officer and my work in other parts of the criminal justice system. However, I began working for social justice, not from a peaceful place, but from the place of an angry rebel. Looking back, I realize that fighting for social justice in various forms was one of the fuels I used to keep the unconscious habit seeds of anger burning strongly. As a result, the unskillful behaviors I engaged in created some harm in my personal and work relationships. I attended my first retreat with Thay in 1991. That retreat started the beginning of the mindfulness journey I have been on ever since. I have lots of habit energy and karma to transform, so this lifelong journey, while not a speedy one, has been and will continue to be a journey characterized by constancy and right aspiration. For me, the path of mindfulness continues to be about waking up to the mystery that is right here in the present moment. Although there continue to be painful experiences and cycles in my life, I get increasingly frequent and reassuring glimpses of my vastness and my interconnection with everybody and everything in the universe. As my practice has progressed, I have begun to understand that working for peace and justice is a journey of gentle honesty and a process of learning how to be present so that every interaction with another person is an opportunity for authenticity and understanding. I was such an unlikely candidate for this path that I consider finding my way to it nothing short of a miracle. Today, I would like to share with you some of the most important things I have internalized about Thay’s teachings. First, I have learned that our personal suffering is the richest compost of our practice. I experienced much pain in my relationship to my parents as a child, in my relationship to my children as a parent, and in my other intimate relationships. I have learned how to use this pain to understand more about what it is to be human. I now understand that blame has often been a barrier I erected not to take responsibility for my own emotions. As I learn more about how to understand and frame my own suffering, I continue to see my own preciousness and that of others. I have learned that imperfection is not a thing to be avoided or blamed on others and that the very things that make me feel so very unlovable, all those defects I tried so hard to hide, are precisely what I have to offer others. I have learned to remind myself that I need to stop relating to what I would like to fix in myself and replace the seeds of project mentality with loving kindness and unconditional friendship with myself and others. It’s helpful to remember that what I am doing is unlocking a softness that is in me and letting it spread in order to soften the sharp edges of self-criticism and complaint. Second, I have learned that the truth is many-sided and can be approached from multiple perspectives, and that it is important to develop a deep sense of openness. I see multiple doors to the Dharma around me every day and understand that different people enter through different doors. To me, any door that helps people lead a more ethical and compassionate life is a legitimate Dharma door. My challenge as a Dharma teacher is to find and invite people through the Dharma doors that they can relate to by translating Thay’s teachings into a language they can understand. Of course, a major focus of mine will be bringing Thay’s teachings to those who work in the criminal justice system because I understand not only their language and fears, but also the injustices committed when people abuse the trust and state authority bestowed upon them. I hope I can help people to understand the difference between fear and faith, between doing the right thing and righteousness, between action and compulsion. I hope I can help them internalize Thay’s teaching that when we stop seeing ourselves solely as victims or oppressors, we can develop a sense of forgiveness for ourselves and others that leads to true redemption. And, in finding their way, I hope I can encourage people to think enough of themselves to claim the right to question what is offered, to investigate what they are being told, to trust their own experiences, and allow others to do the same. I do trust that the process of becoming a Dharma teacher will work in a similar manner as the process of receiving the Five and Fourteen Mindfulness Trainings. The trainings and the possibilities contained within the trainings work on me as I work on them. As my understanding and practice deepens, old habit seeds and energies are transformed as new seeds get watered by living up to the possibilities of the path. So I have decided that the purpose of being a Dharma teacher is no different than the purpose of any student on the path. The purpose is not to do it right but to reside in the joy and possibilities provided by the opportunity to commit more deeply to the Dharma and reap the bountiful harvest that this possibility offers. In finding my way between fear and faith, I have learned that faith is about discovering the existence of an ultimate dimension and learning to live with heart. Discovering fearlessness comes from working with the softness of the human heart and letting the world tickle your heart with the wonders of the present moment and your relationships with others. It comes from being willing to open up, touching your own vulnerability, and having the courage to share your heart with others. This is the path to the authentic relationships that are the litmus test of spirituality. In discovering the difference between doing the right thing and righteousness, I have learned that dogma and righteousness are subtle forms of violence. In contrast, faith enables us to meet life with a sense of curiosity rather than a definition of reality. One of Thay’s greatest gifts to me was the teaching that if we truly understand our interconnection with others, we can all find a victim and an oppressor within ourselves. I can look back and find painful examples of my own mistakes and unintentional abuses of power. Likewise, I can find painful examples of my own victimization. When we learn to acknowledge and make friends with these parts of ourselves, it enables us not to become one or the other. As long as we see ourselves solely as victims, our anger will fuel a dangerous sense of entitlement that can be just as destructive as the oppressor’s abuse of power. When I see all the ways that I have been a perpetrator and a victim, I can relax. I can hold more paradoxes, more dichotomies. I can also let go of my guilt about the past and understand that redemption lies in the correction of the course of my mistakes. I can continually begin anew by taking the opportunity the present moment puts in front of me to make a different choice. Third, I have deeply internalized Thay’s teaching that it is impossible to end violence with violence. I believe this is the biggest challenge and the most important lesson for all those working in the criminal justice system. Working to provide public safety means working for peace and justice, and requires an unwavering personal commitment to non-violence in our own lives and in our environments and systems. This requires a personal aspiration not to contribute to violence or aggression in any form. If the personal is indeed political, the most radical political act of all is to learn how to live in more harmony with everyone and everything. When we understand our interdependence deeply, we understand that when we care for ourselves, we care for others; and when we care for others, we care for ourselves. This understanding enables us to effectively work for peace in ourselves, our communities, and our world. Unfortunately, I work in a criminal justice system based on the premise that punishment of the perpetrator will heal the victim and rehabilitate the perpetrator. Of course, people insistent on punishing each other usually become allied in making each other suffer more. I have observed that it is not the wrongdoer’s repentance that creates forgiveness, but the victim’s forgiveness that creates repentance. This is where forgiveness enters the realm of spirit and paradox. Because it becomes a mysterious gift offered to one who does not necessarily merit it, it becomes the essence of compassion itself. In conclusion, my own path has taught me how important it is to be present to my own life, to trust myself and help others to do the same, to allow my heart to be torn open in love rather than protected in fear. I have learned to keep asking myself if what I am doing is making me kinder, more understanding, and more loving. Cheri Maples, True Jewel, worked in the criminal justice profession for twenty-five years; she is also a licensed attorney and clinical social worker, and co-founder of the Center for Mindfulness and Justice. Cheri practices with SnowFlower Sangha in Madison, Wisconsin. Since I began practicing Buddhism six years ago, I have been almost obsessed with meeting the person who made it all clear to me — Vietnamese Buddhist Zen Master Thich Nhat Hanh. Reading his writings and listening to his Dharma talks electronically has helped me understand what I need to do to build a stronger community. It’s not about trying to make everyone be a Buddhist. It’s about being a better person. Caring more for yourself, others, and the world around you. Especially the last two. It’s about smiling to yourself and to those you meet. I’ve tried to figure out how I could get to Plum Village in France, despite the fact I can’t afford to go. Or to write to him, and hear back from him in words written by his own hand. I then wondered whether Thay would be coming to a city near enough to Ottawa for me to drive to hear him speak, maybe even bow to him directly and just feel that I am in the presence of the closest thing to a Buddha that I may ever know. As I was cutting the grass and listening to an old podcast from public radio’s Speaking Of Faith about a retreat that Thay gave for police officers in Wisconsin, something suddenly awakened in me. I became aware that I was too attached to the notion that I somehow had to touch Thich Nhat Hanh so I could thank him for the way he has touched my life. I had read a number of wonderful books about Buddhism in general, but many of them were confusing to me because they went into great detail about some of the different schools and their specific trainings. The Tibetan Book of the Dead is an interesting document, but it doesn’t easily translate for the Western world. That’s where Thay helped put Buddhism in my heart with an incredible clarity. Some of the tenets of Buddhism can be complicated, but they don’t need to be. I would love to hear the Dharma and feel the inspiration directly from the Master. But in many ways I already have. I have bought a number of his books, given away some to others who needed to read his teachings. I have watched videos and heard his voice electronically. Thich Nhat Hanh has spoken to me and touched me in a way that has opened my heart to others. His writings and teachings were as specifically meant for me as others. I would be thrilled to live in Plum Village as a monk or lay teacher and try to pass on the mindfulness trainings and other things that I have learned. In some ways, I do it on a microscopic scale by passing on kind or inspiring words of my own to others, or on Facebook or Twitter — our generation’s electronic temples. Thank you, Thich Nhat Hanh. Although you may never read these words, their love will go straight to your heart because it is open. Glenn Johnson lives in Ottawa, Canada, where he works as deputy editor of Canwest News Service. He practices with the Pagoda Sangha. Sometimes we meet someone whose Buddha nature shines so brightly that they are like a lamp showing us the way ahead. My Aunt Elinor is that kind of luminous Buddha. She is a form of the bodhisattva Sadaparibhuta, Never Disparaging. Elinor was sent to a mental hospital in 1936 when she was twenty-three years old and the mother of a two-year-old son and a five-month-old daughter. We know now that Elinor had postpartum psychosis, a condition that is treatable. It’s likely that Elinor recovered within several years. And yet she stayed in the mental hospital system for the rest of her life. Her husband died of a heart infection the following June and the children were raised by his sister. Elinor was abandoned by everyone in the family until it was said that she had died. Elinor was my mother’s oldest sister and I grew up wondering who she was and what had happened to her. Until I counted the number of grandchildren in my grandfather’s obituary, I didn’t know that she had children. When I found her married name I began to look for her, hoping to find where she was buried so that I could bring her flowers. I searched for many years. Last year I found Elinor alive in a nursing home in Canton, Ohio. She was ninety-four years old and had spent the past seventy-two years in the mental health system, including forty-two years in the mental hospital, sixteen years in a group home, and fourteen years in the nursing home. Even before I met her, I saw Elinor’s Buddha nature. During a phone conversation, the social worker at the nursing home told me, “Elinor calls the nurses Mother and some of them call her Mother. The others she calls Dorothy or Margery.” The social worker was surprised to learn that Dorothy and Margery were the names of her sisters. Elinor made everyone around her into family! She embodied the quality of kshanti, all-embracing inclusiveness. As Thay explains in Peaceful Action, Open Heart: “When our heart is large enough, we can be very comfortable, we can embrace the sharp, difficult thing without injury.” Elinor taught me that if I could see everyone around me as my mother, my children, if my heart were large enough to include everyone, I would feel happy and safe and live without the burdens of judgment and fear. I enjoyed sitting with Elinor. I felt free to just sit and be present. There was no pressure to please or entertain or even talk. Elinor reminded me that the heart of practice is acceptance. It’s so easy to struggle against the way things are, big things like illness and death, everyday things like traffic jams and frowns. With Elinor at that moment, all was well. She nurtured her spirit with music for many years. And she gave music to everyone around her. “When she first came here, she’d walk over to the piano every night after dinner and play for us. How did she manage to keep her heart open and her spirit alive? She had no family. She lived without hearing her children’s laughter. She owned nothing and wore what was handed to her. She ate what was given. She lived without privacy. She wasn’t able to walk down the street for a cup of tea. She was not bitter or angry, although she did not suffer fools. Her life was not cluttered with things she didn’t need. “I don’t want anything at all,” she wrote on a sheet of lined paper clipped into a blue binder. She had little choice except how she related to herself and to those around her. She learned to live beautifully with herself and others. I take strength from the way Elinor survived so well with so little, that she kept what was most valuable — her heart and her music. She was a Buddha in her simplicity, her affection, and her sense of interbeing. Elinor was my teacher. She showed me how to be aware of love, to give and receive the energy of love, to give space for love to exist and to ripen. I became aware of what cut off the flow between us, things like needless questions and extraneous comments. Elinor spoke out of her true nature and not as I might have wished or expected. That encouraged me to be less concerned about results and more aware of what was true within and around me. Elinor always responded to love and affection. “I love you,” I told Elinor. “That’s the way it should be,” she said. Elinor’s mother passed away suddenly when Elinor was sixteen, and her father, who could have signed her out of the hospital when she recovered from the post-partum psychosis, never came to take her home. “I love my dad,” she said. “I always will.” This too is Sadaparibhuta’s nurturing love, even in the midst of betrayal and rejection. I come from a family that tends to end relationships when pain or shame overwhelms love. When I think of Elinor, I am aware that when the seed of love has grown small or been lost in the face of fear or hurt, I can find that tiny seed, and with nurturing, it will grow strong again. In July I asked Elinor, “Do you have children?” “Yes,” she said. “I have two and I love them very much.” That was the permission I needed to search for her children. I was able to find them, and Elinor’s daughter and granddaughter came right away to visit her. In January Elinor took her last breath. The weekend of her memorial service, Elinor’s family and four of my siblings met for the first time. During the service I read a passage from the Bible: “Love bears all things, believes all things, hopes all things, endures all things.” Tears fell as I read, knowing that Elinor was and is the love that bears all things, endures all things. Before I began to practice, before I found the Sangha, I would have fallen into sorrow and seen Elinor’s life as an unbearable tragedy. Belonging to a Sangha that is supportive and affectionate, I am more aware of the energy of love even when it springs from the muddy ground of a life lived in a mental hospital. Sitting with Elinor enlarged my heart. The weeds of mystery and tragedy and fear withered as Elinor watered seeds of love and simplicity and interbeing. What an amazing surprise to find that the person who the family abandoned is the one who restores our lost connections and the love that goes with them. Susan Hadler, True Lotus Recollection, practices with the Washington MIndfulness Community in Washington, D.C. It was the last straw when Caroline walked into my writers’ group. My dislike for Caroline was a long-standing, pure prejudice, our acquaintance limited to her occasional inquiry about my mother. As she was closer to my mother’s age than mine, I judged her insincere; if she really cared, she would ask my mother. Also I identified her as one of the elite with whom I feel uncomfortable. My mother died in October of 2006. Returning from Mexico the following April, Caroline said consolingly: “You must miss your mother dreadfully,” leaving me speechless, as I did not. Caroline had returned interested in prison ministry, and had been given my name to contact. Soon we were carpooling to my two prison ministries. One day she told me she would be away the third weekend in October. “So will I,” I said. “Where will you be?” We were both going to the same retreat. We began driving together to my two Sanghas. When she headed back to Mexico, I breathed a huge sigh of relief. And now she was in my newfound writers’ group. Tuesday was my early morning Sangha; Monday night I slept under a black cloud. I woke upset by my lack of either Buddhist or Christian compassion, hopeful that Sangha wisdom would help. There was the awkward allusion to my loss, which I now recognize as the sort of dead-end assumption for which Mom was notorious. Caroline was making demands on my time; I had been Mom’s sole caregiver. The match was unmistakable. Within minutes the black cloud dispersed and Caroline became simply Caroline, a person of mutual interests, no longer a threat to my identity. I realize now, yes, I was tense whenever I thought of Mom. Her love was so vast, so suffocating, that I could not return it in kind. For that I had always felt guilt, while remaining mentally loyal, denying negative feelings as best I could. I now saw clearly that I had projected those feelings onto Caroline. My mother had idolized her mother, who had been instrumental in driving away my father, whom Mom also idolized. I now saw that Mom had been so judgmental because she had projected unacknowledged, unacceptable family flaws onto others, a trait which I was continuing. With that realization I felt only compassion for the mother I had long found difficult. And I now understood what it meant to heal the past in the present. Ann G. Moore, Skillful Acceptance of the Heart, lives in Stonington, Connecticut and practices with Clear Heart Sangha in Matunuck, Rhode Island, as well as the New London Community of Mindfulness in New London, Connecticut. Our planet is under stress and our civilization is in trouble, according to L. Brown, president of the Earth Policy Institute and a highly honored scientist. The majority of scientists agrees that our planetary climate is heating up and that there is an urgency to prevent further damage. Increasing temperatures, melting glaciers, rising sea levels, expanding deserts, shrinking forests, disappearing plants and animals, eroding soils, and falling water tables are just a few signs. These imbalances have the potential to lead to an immense amount of suffering through droughts, drinking water shortages, famines, increased occurrences of storms, floods and other climate-related disasters. Global warming is not only a biological crisis; it is also an emotional crisis, a psychological crisis, and a spiritual crisis. It is a crisis of me as a person, of us as a society, of us as the human species, of all beings inhabiting planet Earth (including humans, animals, plants, minerals). But this crisis is an opportunity for fundamental changes in our own lives, in our situation as humans, and in the way we relate to the planet. It is an opportunity to practice interbeing. As spiritual practitioners we can practice awareness of the rising and falling of all civilizations and acceptance of the coming death of our civilization. We can practice with non-fear when facing global warming. Looking at the scientific proof of the need for urgent action, we can practice non-despair to keep our freshness for the needed action. It is time to face and digest what is going on around us and act accordingly. The methods of raising animals for food are especially alarming in the USA. But according to a recent UN report, it is the case worldwide that with increased prosperity, people are consuming more meat and dairy products every year. Global meat production is projected to more than double from 229 million tons in 1999/2001 to 465 million tons in 2050, while milk output is set to climb from 580 to 1043 million tons. (2) So the current situation in the USA will be mirrored in a growing number of countries. The U.N. recommendation is clear: “The environment impact per unit of livestock production must be cut by half, just to avoid increasing the level of damage beyond its present level”.1 We need to reduce at least 50 percent of meat industry products, and we must consume 50 percent less meat. The U.N. also reports that even if cattle-rearing is reduced by 50 percent, we still need to use new technology to help the cattle-rearing industry create less pollution, such as choosing animal diets that can reduce enteric fermentation and consequent methane emissions. Urgent action must be taken at the individual and collective levels. As a spiritual family and a human family, we can all help avert global warming with the practice of mindful eating. Going vegetarian may be the most effective way to fight global warming. Eating a vegetarian or vegan diet is possible for most people on our planet. We simply need to pay attention to creating a balanced diet, perhaps supplementing certain nutrients like vitamin B12. A completely vegan diet might not be possible for everyone, but reducing our consumption of meat is possible. This will reduce greenhouse gases and help to create less suffering for all beings on our planet. Brother True Dharma Sound, Thich Chan Phap Thanh, was formerly known as Bernd Ziegler. He resides at Deer Park Monastery in Escondido, California. 1 H. Steinfeld, P. Gerber, T. Wassenaar, V. Castel, M. Rosales, and C. de Haan, “Livestock’s Long Shadow: Environmental Issues and Options,” Livestock, Environment and Development (2006). 2 “Rearing Cattle Produces More Greenhouse Gases than Driving Cars, U.N. Report Warns,” U.N. News Center, 29 Nov. 2006. 3 Read, C., “Behind the Face of Malnutrition: What Causes Malnutrition?”, New Scientist magazine, Issue 1704, 17 Feb. 1990. 4 G. Eshel and P. Martin, “It’s Better to Green Your Diet Than Your Car,” New Scientist magazine, Issue 2530, 17 Dec. 2005. 5 Thich Nhat Hanh, “Mindfulness in the Marketplace – Compassionate Responses to Consumerism,” Parallax Press, Berkeley, California (2002). 6 M. Vesterby, K. Krupa. “Major Uses of Land in the United States, 1997,” Statistical Bulletin No. 973. Resource Economics Division, Economic Research Service, United States Department of Agriculture (1997). I feel very happy that, under the guidance of Thay, our Sangha has made a successful transition to a diet free from animal products, in all of the main practice centers and during retreats of mindfulness. Our Sangha is making a significant contribution to reducing the production of greenhouses gases which contribute to global warming, and is setting a powerful example for others in the world to follow. Furthermore, we contribute less to the suffering of animals in the egg and dairy industry that often live in inhumane conditions. Red blood cells carry oxygen and other nutrients throughout the body; the symptoms of anemia range from mild to severe. The most common physical symptoms are pale skin, weakness, fatigue and lack of energy, numbness or poor circulation in extremities, loss of appetite and weight loss. Symptoms can also include cognitive changes such as memory loss or forgetfulness, confusion, difficulty concentrating, thinking and planning, general malaise, and depression. Having suffered from a severe case of anemia after living at Plum Village as a novice monk, I would like to help the community be aware of this important nutritional aspect. In the past couple of years, I have spoken with several people in the Sangha, both lay and monastic, who shared that they had experienced mild cases of anemia, as diagnosed by a medical doctor. Many people in the Sangha are aware of the need for B12 in a vegan diet, but it may not yet be common knowledge throughout the community. Hopefully we can help everyone to be aware of the nutritional supplements needed in order to prevent individuals from experiencing anemia and its health related consequences. For the vast majority of people, a daily multivitamin with B12, or a B-complex vitamin will do the job. Taking care of our bodies in this way may help us to cultivate better health, which gives us more energy and stamina for our practice of mindfulness and for serving others. One morning, feeling serene and well-grounded after meditating, I took a mindful shower. Awash with gratitude I stepped out with a smile and looked in the mirror. All I saw was my big belly and love handles. Contented joy vaporized into distress. I berated myself, obliterating peace and the morning’s merit. Breathing in, I realized the thoughts and feelings I was consuming were toxic. Breathing out, I released and attended to them. My suffering had something to tell me. How do I cultivate peace and compassion for all sentient beings when I find parts of myself unacceptable? The mindful penetration of each body part cultivates understanding and gratitude. I appreciate their miraculous design, their unique and interdependent natures. Each part serves and supports all others; each part serving and supporting my life and transformation. In time I penetrated my fat with the same equanimity as my heart or lungs. When judgment and aversion were overcome an old knot was untied. With right concentration, I see that fat is storing energy for future use and is an evolutionary survival tool. My eye of understanding can now see fat as battery packs instead of a cloak of shame or nemesis. My heart softens and I suddenly appreciate my fat as a precious gift and see that it is here to serve and support me, too. “Oh, my poor misunderstood fat, I am here for you.” I think of loved ones and others who are unable to gain weight due to illness, of the millions who are starving, malnourished, or lacking enough to eat. For the first time, I am able to thank my fat and express real gratitude that it is here for me. I appreciate that it is working well and caring for me by storing energy for future use in times of famine, drought, or hardship. With an open heart, I let my fat know that I’m grateful it’s here for me but I do not need this amount of energy stored presently. With deep sincerity and a smile I let my fat know that I am working for its liberation as well as my own. Looking deeper, I see that liberating stored energy from my body makes it available elsewhere, in another form, where a need may exist. Nothing is wasted in nature. Energy transforms, Neither produced nor destroyed. Weight is not the enemy, I bow deeply to my fat. When I embrace my pain, distorted perceptions are revealed. I gain understanding and insight; in this case, a new perspective on the way I view my body and weight. Looking deeply I touch the reality of impermanence, non-self, and interbeing. Accepting my fat, new peace and happiness are born. Mindfulness practice led me to exercise. There were times when I wanted to quit a workout early. I learned to exercise for those who cannot do it themselves instead of just ‘toughing it out’ for myself. I think of my hospice patients at the VA Hospital, the wounded, ill, lame, and incarcerated. I can work for them and my ancestors, for my dead son, David, and the uncountable masses who would give anything for the good health and freedom I enjoy. Interbeing supports and sustains me on all levels. Thinking of others helps me practice mindful consumption as well. I can transform hunger pangs from a self-centered panic button to a mindfulness bell. My hunger becomes “the hunger,” shared by millions, most of whom lack the choice of when and what to eat. Small self becomes the large self. I vow to liberate stored energy To benefit all beings. Eating mindfully for nutrition, Transcending indulgence. Even as a vegetarian my relationship to food can be unwholesome. I’ve used food as a drug, but thought of it as a comfort as I eat to escape my feelings, fill a void or find pleasure. When I eat sweets I’m compelled to keep eating them. I tell myself, “This is a treat,” and “I deserve this pleasure.” When finished, I’ve consumed thousands of nutritionally void calories without satisfaction. I’ve watered seeds of indulgence and gluttony, not well-being and happiness. If I am mindful of my feelings I know that I am suffering. Buddha taught that there is a cause and end to suffering. My suffering has something very important to tell me. Piercing the cloud of denial and illusion, I see that eating for taste alone is a root cause of my suffering. The end of this suffering is eating for nutrition. I no longer mistake sweets for something wonderful. Not eating sweets is the real treat. When appetite calls I know I’m alive. The fire of transformation ignites A calming smile. All is well. I’ve dropped three pants sizes in the last year and am in better shape than I’ve been in a long time. Even so, one look in the mirror at my remaining pot belly and that old tape, “What’s the use?” can pop up, shadowed by doubt and futility. Breathing in, I recognize my old friends. Breathing out, I know these are just thoughts and feelings. Embracing them I smile. Breathing in, I know I want to lose more weight. Breathing out, I know the pounds are dropping. Slow and steady. Breathing in, I know I am doing well. Breathing out, I smile as my practice grows stronger and supports me. I question my thoughts, feelings and perceptions as they arise. Dining at a friend’s house I was offered homemade chocolate mousse and politely declined, feeling quite good about myself. The hostess had worked hard on her creation and my wife explained, “Pete doesn’t eat sugar any more.” Craving arose immediately. Breathing in, I observed a small voice whispering, “See what you are missing? You can’t have that.” For that instant, mousse seemed like the key to my happiness. Suddenly, eating it seemed a greater act of independent volition than declining. An expression of freedom! Other thoughts started to dog-pile on the first: it would make the hostess very happy if I broke my diet for her creation, I don’t want to hurt her feelings, I adore chocolate, it does look great! Breathing out, I recalled the pain I’ve experienced firsthand from unmindful consumption. I reaffirmed my well-being, knowing I could eat whatever I wanted right here and right now. I was not “missing out,” but gaining solidity in freedom from suffering. I politely explained to them, as well as to myself, that I had not “stopped” eating sugar or dessert, but was choosing not to, just for today. There is no diet to stick to, I am not stuck. There is no renunciation. I eat for nutrition. Am I feeding my liberation or my suffering? Thay explains, “True love cannot exist without understanding.” Sometimes, what I perceive as love is a mislabeled distortion, a romantic guise for obsession. I’ve loved food all my life, but the nature of that love was self-centered gratification. As I practice mindful eating and the Five Contemplations, my love of food is no longer based solely on gluttonous self-centeredness. Hunger pangs ring A mindfulness bell. In a moment’s pause I taste the fullness Of my great essential nature. As I cultivate true love, it radiates, inside and out. When I’m awake in the present moment and I know what I am eating, in the mundane and greater sense, the nutritional value of my meal increases. I am enriched on all levels and dine on the miraculous, feeding my awakened nature and physical form. Abstaining from meats I’m cognizant of the great harm caused directly and indirectly by the consumption of animals, engaging compassion for all creatures and our mother Earth, and truly generating the “peace, well-being and joy in my body, in my consciousness and in the collective consciousness” that the Fifth Mindfulness Training describes. The taste of love is sweeter than chocolate mousse. My fork rests between bites Inviting full awareness Of habit energy and what I chew. When I focus on weight loss there is no satisfaction. I can’t lose it fast enough and fear gaining it back. I want to lose weight but it isn’t my goal. The practice is my process and the process is my goal. There can be no failure, only an aspiration. The spoon and I inter-are. She breathes. We release between bites. I am deeply grateful to my teacher, Thay, who helps me turn walls to doors while cultivating true love. *See Exercise 7 in Healing and Transformation: The Four Establishments of Mindfulness by Thich Nhat Hanh. Peter Kuhn, Deep Transformation of the Heart, lives in San Diego, CA with his wife Jackie. He is a recovering addict, clean and sober 23 years, and practices at the World Beat Center Sangha, the Still Ripening Sangha and Sweetwater Zen Center.